A celebration of one of the most significant artists working in glass today. 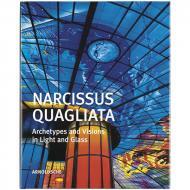 Includes more than 350 color illustrations along with essays and appreciations of Quagliata's work and influence by a number of authors including Bullseye Gallery Director Lani McGregor. Each copy also includes a DVD with a documentary, narrated by the artist, on the making of Dome of Light, a monumental public art installation in Koahsiung, Taiwan. 2013, hard cover, 256 pages, color.